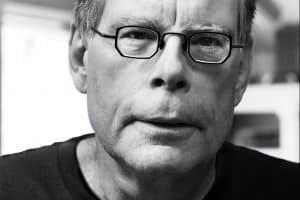 PEN America honored legendary suspense writer Stephen King with the 2018 PEN America Literary Service Award at its Literary Gala on May 22 at the American Museum of Natural History in New York. PEN America confers the Literary Service Award each year to a critically-acclaimed writer whose body of work helps us understand and interpret the human condition, engendering empathy and imagination in even the darkest hours. Scribner released King’s newest novel, The Outsider, on May 22, the day of the PEN America award presentation. Carolyn Reidy, President and Chief Executive Officer of Simon & Schuster, Inc., was recognized as the annual ceremony’s Publisher Honoree. Under her leadership, Simon & Schuster has published many acclaimed and award-winning works of lasting cultural significance, has greatly expanded its publishing activities in international territories, and has been an industry leader in finding new audiences through digital capabilities. Reidy’s commitment to diversity at Simon & Schuster has led the company to make substantial progress in creating a more diverse workforce and to publish a wider range of voices that is more truly reflective of our larger culture today. 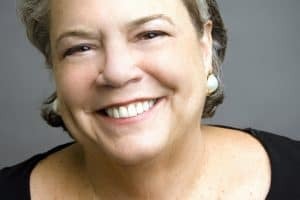 Reidy also serves on the Boards of Directors of the Association of American Publishers and the National Book Foundation, and, as a former long-serving board member of Literacy Partners, has provided vital support to literacy programs to engender a new generation of readers and writers. 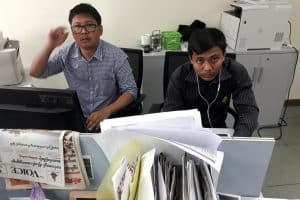 Detained Reuters journalists Wa Lone and Kyaw Soe Oo received the PEN/Barbey Freedom to Write Award for their work exposing the massacre of 10 Rohingya men in Myanmar’s Rakhine state. The PEN/Barbey Freedom to Write Award shines the global spotlight on an imprisoned writer or creative artist persecuted for exercising his or her right to free expression. Previous winners include the late Chinese Nobel Peace Prize laureate Liu Xiaobo; Egyptian novelist Ahmed Naji; and Ukrainian filmmaker Oleg Sentsov. The PEN/Toni and James C. Goodale Freedom of Expression Courage Award will recognize an individual or organization that embodies courage in self-expression. 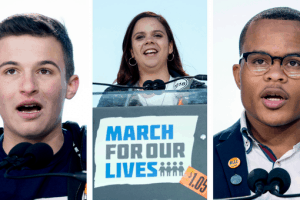 Previous winners include the Women’s March, the surviving staff of French satirical weekly Charlie Hebdo, and Flint, Michigan, water activists Dr. Mona Hanna-Attisha and Lee-Anne Walters. 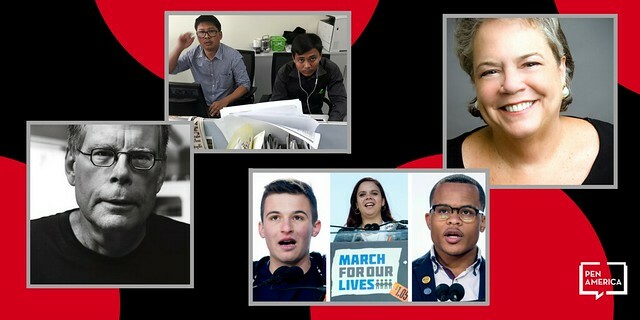 PEN America honored leaders in youth activism against gun violence Cameron Kasky and Samantha Fuentes, students at Marjory Stoneman Douglas High School, and Zion Kelly, the twin sibling of a victim of gun violence, with the 2018 PEN/Toni and James C. Goodale Freedom of Expression Courage Award.